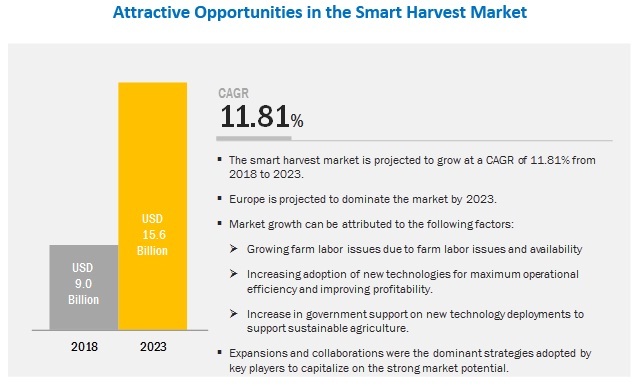 [136 Pages Report] The smart harvest market is projected to reach USD 15.6 billion by 2023, from USD 9.0 billion in 2018, at a CAGR of 11.81% during the forecast period. The rise in population has led to increased food demand, which in turn has led to increased pressure on farmers to increase yield and area harvested for various crops. However, global labor shortage in agriculture is one of the major factors leading to loss of yield due to improper maintenance and farming practices. To cater to this issue, farmers are highly adopting farm mechanization and other smart agriculture techniques to optimize their crop yields. The smart harvest market has been segmented on the basis of component into hardware and software. The market for software is projected to record the higher CAGR between 2018 and 2023. The hardware aspect of the smart harvest market includes harvesting robots, automation and control systems, sensors, and imaging systems. All three hardware components are designed to coordinate their activities to move, identify, and harvest the fruit/vegetable. In the coming years, the integration of AI (Artificial Intelligence) in the smart harvest systems would allow the machines to make their own decisions based on the appropriate parameters. The smart harvest market is segmented on the basis of site of operation into on-field, greenhouses, and indoor farming. The market for on-field systems is projected to record the highest CAGR between 2018 and 2023. The development of smart harvest technologies and robots aims to minimize the impact of labor shortage, while also maximizing the benefits realized by the end users in the form of cost and time benefits. Declining farmlands in developing countries are expected to favor the growth for indoor systems during the next decade. The harvesting robots market is segmented on the basis of crop type into vegetables and fruits. Manufacturers are developing and testing various harvesting robot technologies for commercial deployment during the forecast period. The current generation of smart harvest technologies is capable of harvesting a variety of fruits including apples, strawberries, and citrus fruits (lemons and oranges). The use of smart harvest systems expands the possibilities of integrating yield monitoring sensors and ripening controllers across a wide variety of fruits. 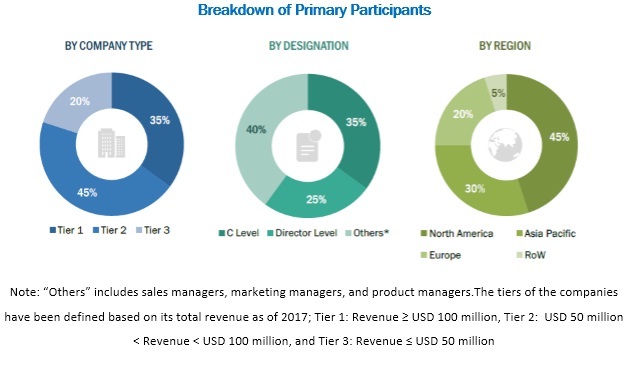 The European smart harvest market is estimated to be the largest by 2023, while the Asia Pacific market is projected to grow as the fastest-growing region from 2018 to 2023. Europe and North America also host the largest concentration of manufacturers in the smart harvest industry, with major industry leaders maintaining their operations in the region. The strong agriculture sector in the region and increasing dependence on technology is expected to bolster prospects for the smart harvest market in the Asia Pacific region. Key players in the market include Robert Bosch GmbH (Germany), Deere & Company (US), Smart Harvest Ltd. (UK), Dogtooth Technologies (UK), Harvest Automation (US), Panasonic Corporation (Japan), Root AI (US), Abundant Robotics (US), Iron Ox (US), Agrobot (Spain), Energid Technologies Corp. (US), FFRobotics (Israel), Vision Robotics Corp. (US), Metomotion (Israel), AVL Motion (Netherlands), and Harvest Croo (US). These players are undertaking a strategy involving new product development and launches, and divestments to improve their market position and extend their core competitive advantage. In September 2018, Energid Technologies Corporation (US) launched a new software development kit and framework version of its Actin software. The new Actin 5 software incorporates real-time monitoring, adjustments, and inputs for robots, in which it is installed. The Actin 5 software is designed to emulate dynamic functions and help robots respond to a wide array of scenarios such as navigation, control, monitoring, and other functions without compromising on the overall effectiveness. In January 2018, Panasonic Corporation (Japan) unveiled a prototype of their new fully autonomous tomato-picking robot in Tokyo. The robot is incorporated with high-resolution cameras, sensors, and artificial intelligence features to identify and pick ripe tomatoes. The robot has undergone extensive development and testing sessions since 2013 before the launch of its prototype stage. What are the upcoming commercial applications for smart harvest robots? What is the impact of the indoor farming industry on smart harvest? What are the new technologies being introduced in smart harvest? What are the latest trends in smart harvest? 9.5.2.1 Increasing Adoption of Advanced Farming Equipment in Argentina Supplements Growth of Smart Harvest Technologies. 11.17.1 Exabit Systems Pvt. Ltd. The study involved four major activities in estimating the market size for smart harvest. Exhaustive secondary research was conducted to collect information on the market, peer market, and parent market. The next step was to validate these findings, assumptions, and sizing with industry experts across the value chain through primary research. Both top-down and bottom-up approaches were employed to estimate the complete market size. Thereafter, market breakdown and data triangulation were used to estimate the market size of segments and subsegments. In the secondary research process, various secondary sources such as Hoovers, Bloomberg BusinessWeek, and Factiva have been referred to, so as to identify and collect information for this study. These secondary sources included annual reports, press releases & investor presentations of companies, white papers, certified publications, articles by recognized authors, gold & silver standard websites, agricultural organizations, regulatory bodies, trade directories, and databases. The market comprises several stakeholders such as raw material suppliers, technology and service providers, end-product manufacturers, and regulatory organizations in the supply chain. The demand side of this market is characterized by the technology adoption and diverse application industries. The supply side is characterized by development of the robotics, software applications, and sensor technologies. Various primary sources from both the supply and demand sides of the market were interviewed to obtain qualitative and quantitative information. Given below is the breakdown of the primary respondents. After arriving at the overall market size-using the market size estimation processes as explained above-the market was split into several segments and subsegments. In order to complete the overall market engineering process and arrive at the exact statistics of each market segment and subsegment, the data triangulation and market breakdown procedures were employed, wherever applicable. The data was triangulated by studying various factors and trends from both the demand and supply sides in the food, feed, and pharmaceutical, nutraceutical, and personal care industries. Robert Bosch GmbH (Germany), Deere & Company (US), Smart Harvest Ltd. (UK), Dogtooth Technologies (UK), Harvest Automation (US), Panasonic Corporation (Japan), Root AI (US), Abundant Robotics (US), Iron Ox (US), Agrobot (Spain), Energid Technologies Corp. (US), FFRobotics (Israel), Vision Robotics Corp. (US), Metomotion (Israel), AVL Motion (Netherlands), and Harvest Croo (US). This research report categorizes the smart harvest market based on component, site of operation, and crop type.